It’s slime time and this is one of my absolute favorite slimes EVER! I just think it’s gorgeous. Of course, I also love all things rainbow and love how the colors just pop on the black slime. 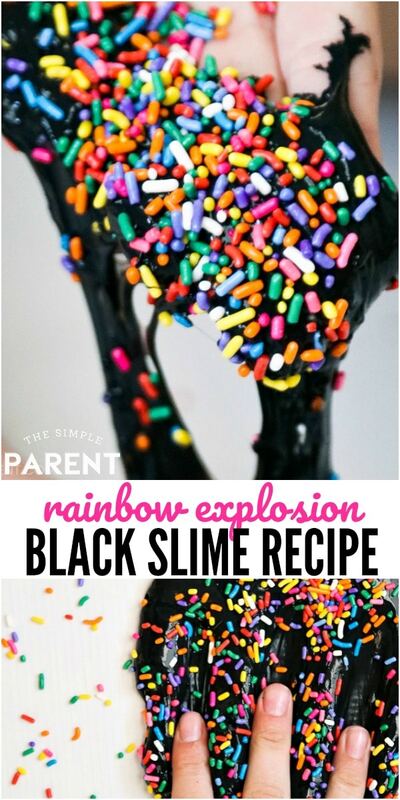 If you haven’t made Rainbow Explosion Black Slime before (or any kind of black slime) then you have to try this one! It’s just the coolest! It’s also so easy to make! This paint slime is a basic black slime recipe. But then we add a POP by using sprinkles to really up the wow factor on this slime while still keeping it really simple. First things first. While this is an easy DIY rainbow slime thanks to the sprinkles, it is not an edible slime. 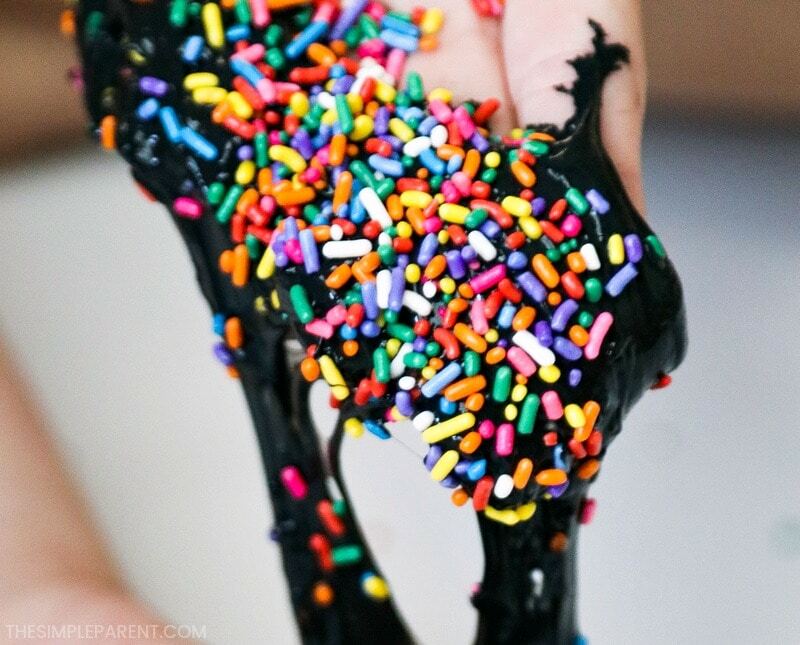 Once you add the sprinkles to the black slime, they’ve become part of the science of it all and only kids old enough to keep it away from their mouths should be allowed to play with it! That’s my first safety warning. My second safety warning is while this slime recipe will teach you how to make slime without Borax, it is not chemical free. 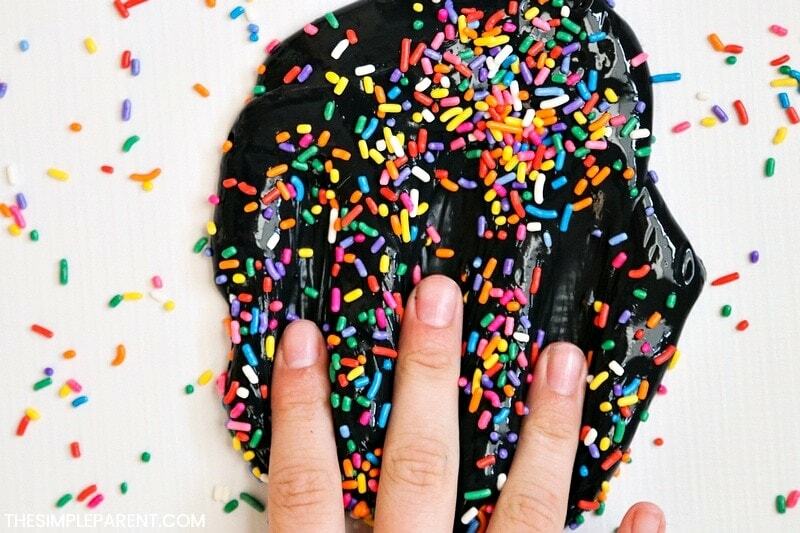 This rainbow explosion black slime is a liquid starch slime that also uses acrylic paint. I’m personally more comfortable using liquid starch with my kids than Borax, but I still make sure that everything gets cleaned thoroughly once we’re done playing with it. Hands get washed and all surfaces and containers are thoroughly washed after slime time! Now that we’ve gotten the warnings out of the way, we’re ready to gather the slime ingredients! This slime recipe is going to show you how to make slime with paint! Like our blue fluffy slime, it has a very short list of materials you need! Since this is not a fluffy slime, you won’t need shaving cream. But you will need black acrylic paint to go with the slime basics of glue and liquid starch! Oh and don’t forget those sprinkles! 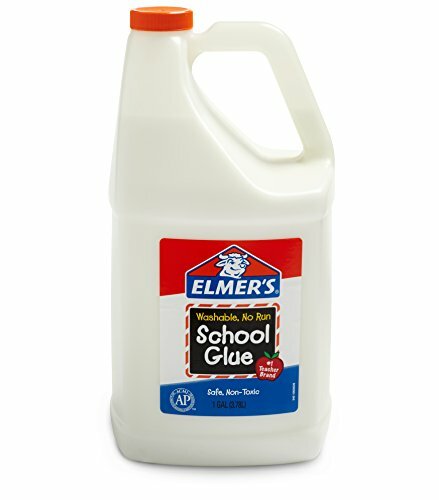 White school glue – The only time I might consider the little bottles of glue would be when school supplies are cheap in the fall. Otherwise, if you make slime on a regular basis, you want to go big and snag a gallon or two. It’s so much easier to pour! Liquid starch – I can never find Sta-Flo at my local stores so ordering it is the easy way to get this slime basic! We use it in most of our slimes! 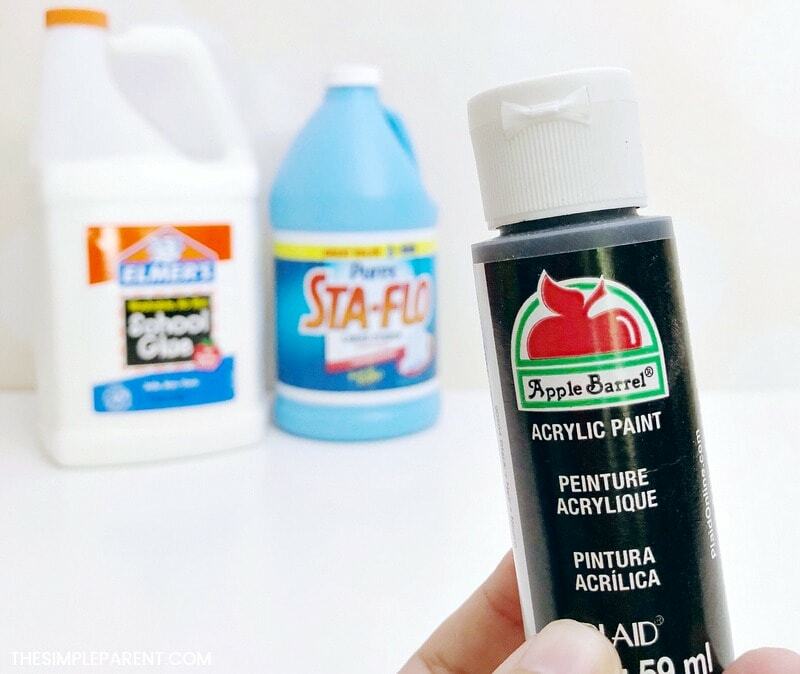 Black acrylic paint – This is what makes the amazing black slime magic happen! Rainbow sprinkles – You can use any shape or size sprinkles for this rainbow slime. You really just want to choose some that have bright colors. Once you’ve got all of your slime ingredients, you’re ready to learn how to make slime with acrylic paint and then add your rainbow explosion! You don’t have to measure everything perfectly, but know that you’ll end up with about the same amount of slime as the amount of glue you use for this rainbow slime. 1. Pour your desired amount of glue into a bowl. I use about 1 cup of glue per kid who will be playing. It doesn’t have to be exact! Just go with your gut! 2. Add black paint to the glue. I don’t measure this at all. I squeeze some in and we start stirring it. If you need more color, add more paint. Add paint until you’re pleased with the color of your black slime. The color in the bowl will be the color slime you end up with! 3. Add the liquid starch to the bowl. Start with about 1/3 of a cup and stir. GO SLOW! This is the one step where you can mess up the slime. But if you go slow, you’ll be fine. The slime should start forming right away. Stir for about a minute or so. Then you should be able to start using your hands to knead the slime. If it’s too sticky and you can’t get it off your fingers, then you need to add more starch. It’s easier to add more starch if you need it than to add more glue. If you end up needing more glue, the slime might not have the consistency you really want in the end. 4. Once you take the slime out of the bowl, spend a few minutes kneading it with your hands. Pull it and push it. It could take a few minutes for it to really get the slime texture you want. Don’t give up too early! 5. Once your slime is ready, lay it on a flat surface and flatten it out. 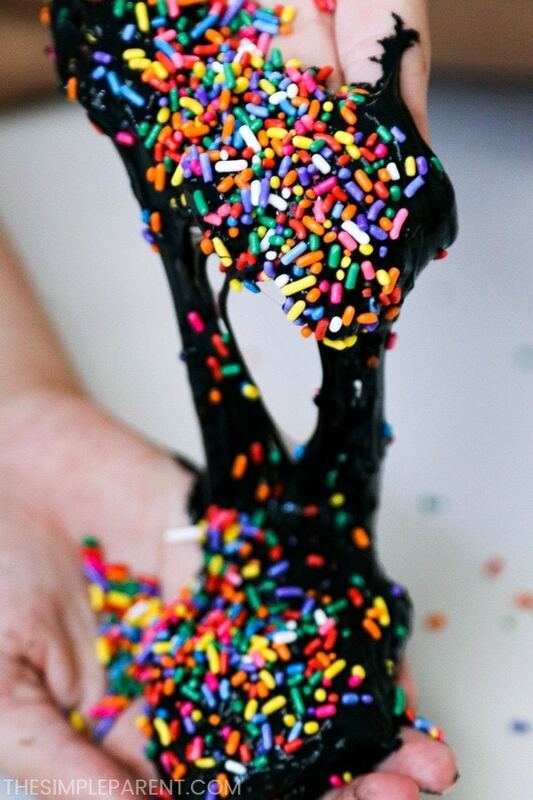 Then get your rainbow sprinkles and sprinkle generously on top of the slime. Let them sit for a bit so they stick. 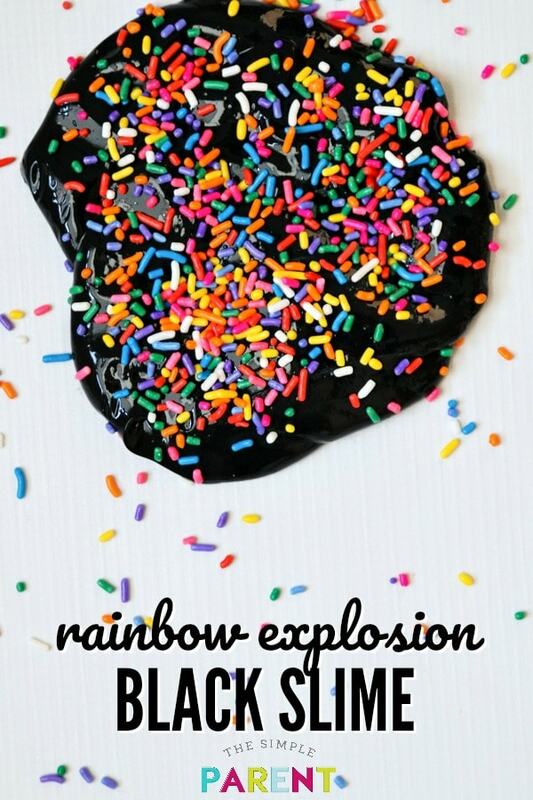 Then have fun playing with your rainbow explosion black slime! Push it! Pull it! Stretch it! Isn’t it gorgeous? I love how the rainbow colors really pop against the black slime background! You can have fun making this with different colored sprinkles. It would work great for Halloween with orange sprinkles or even a lime, purple, and white combo. I think we have a container of those in our pantry! Once you know how to make paint slime, you can make almost any slime you want to make! 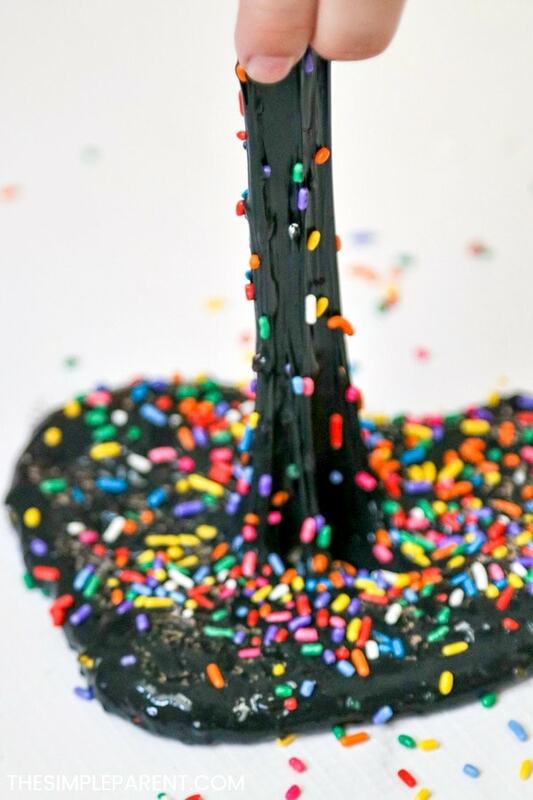 And be sure to click the photo below to pin this black rainbow slime for later!